The weather may have been grim, but what transpired on the field was picture perfect for BC High. 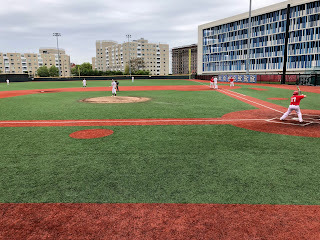 Making his first start in over a month on Tuesday, Eagles’ ace Mike Vasil fired four shutout innings allowing just one hit and striking out six while Sean O’Connell went 2-for-3 with an RBI as BC High defeated St. John’s Shrewsbury at BC High’s Monan Park. Vasil, a potential first round pick in this year’s MLB Draft, finished with 50 pitches, a limit that was decided pregame. Out of those 50 pitches, 36 were strikes. In all Vasil threw 40 fastballs, 31 of which found the zone. According to a handful of scouts in attendance, Vasil mostly hovered around 93 miles per hour and occasionally hit 96. After being sidelined for the past month, Vasil felt he had something to prove. BC High (10-5) coach Norm Walsh, meanwhile, commented on how one of the most enjoyable aspects of Vasil being back is that now all other false rumors about his status can be put to bed. Walsh recounted a story about a former student and current Blue Jays scout Pete Holmes that illustrated just how ridiculous the rumors became. Pioneers’ starter Mike Bean matched Vasil pitch-for-pitch through the first four innings limiting the Eagles offense to just one hit. In the fifth BC High broke through. John MacDonald and Luke Murphy connected on back-to-back triples to make it 1-0 Eagles. Two batters later, Marty McCormack lined an RBI single into left center field to extend BC High’s lead to 2-0. One inning later, BC High added what proved to be some much needed insurance. Vasil, Dave Driscoll, and O’Connell drilled three consecutive doubles to make it 4-0 BC High heading into the final frame. O’Connell, who came on in relief of Vasil, pitched a clean fifth and sixth inning but in the seventh ran into trouble. Sean Burke hit a long double to begin the frame and Jake Hamel followed by walloping a 1-0 pitch well over the wall into left center field for a two run shot to trim BC High’s lead to 4-2. Tom Moschella proceeded to reach on an error bringing the tying run to the plate. O’Connell, however, battled back and recorded a strikeout via his fastball before inducing a 5-4-3 double play to seal the win.